Any company striving for success realizes the place of building their brand — it is their top priority. Performance marketing has been regarded as the ability to target the right customer at the perfect time and place. 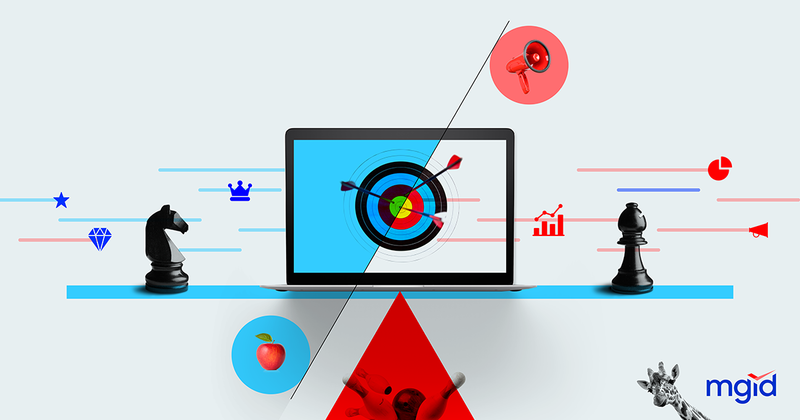 Historically, marketers and advertisers have crossed the thick line between brand and performance marketing, deeming them to be completely different areas. The good old notion is that brand marketing is related to long-term revenue and perspective, relationship-based marketing and storytelling/creative content. At the same time, performance marketing is connected with short-term revenue, customer acquisition, and direct/result-based content. In the past, when digital advertising, cutting-edge tech and everything in between did not exist, budgets were separated by branding and performance. These two strategies were kept apart due to content and measurement. At that time there were simply no tools, as well as no data, for tracking how advertising can be engaging and creative simultaneously while bringing monetizable results to the table. Before devices with internet appeared in our pockets, the TV ruled the world. Marketers resisted giving up a channel with a massive audience which is easily measurable. These were the reasons for brand and performance marketing to be on opposite sides. During recent years, this notion has been gradually fading away, blurring the line between the two dimensions. The perceptions of marketers have changed to consider brand and performance marketing the two sides of one coin. The perceptual shift is mainly attributable to the evolution of the conventional advertising ecosystem to a digital one in combination with performance data advancements and strategic partnerships. The transformations make it possible for advertisers and marketers to develop smart and highly effective advertising. And speaking of effective advertising, we mean an alloy of creativity taken from brand-driven marketing mixed with result-driven strategy taken from performance marketing. Dwellers of the marketing world realize the great importance of understanding and engaging their audience in deeply personalized, seamless content streams. This is exactly where the two worlds collide. Passive and one-way messaging was replaced by personalization and relationship-building, and the new era of interdependency between brand and performance marketing has begun. In order to understand the essence of the concept we have to think of the big names. Let’s take Pepsi, for instance. Their ads are fun to watch, the drink always looks insanely refreshing; the ads are not asking for anything, they just invite the audience to take the customer journey and have an experience with this product. Taking into account the long history of the brand, the company managed to grow a huge following — seriously, everybody knows their name. So brand marketing is about creating a certain image and familiarity in the minds of customers. In other words, the brand is used to drive marketing. Brand marketing is used for establishing trustful long-term relationships with loyal clientele. Billboards, loyalty programs, slogans and differentiation from competitors, belong to the most common brand marketing strategies. The concept of performance marketing pertains to an online marketing model where the advertiser pays for the achieved results rather than hopes and experiments. The effectiveness of the campaign is reflected by real data accumulated through tracking systems. Marketing companies and advertisers are paid after a particular action takes place such as click, lead or purchase. The framework operates on the basis of paid marketing channels, such as search engine marketing, sponsored advertising, social media advertising, affiliate marketing, and native advertising. Each channel is characterized by its own specific audience and implies working with different platforms in order to reach these audiences. Each platform provides the options to fulfill targeting and segmentation, and when the target audience is defined the stage is followed by bidding. From the marketer’s perspective, content strategies, as well as the main message, need to be thought about in a 1:1 ratio so that they can target a specific audience. The mixture of automation and analytics will require a vast range of new tools for the landscape assessment. However, that does not mean creativity should be removed from the process. Actually, creativity, as an essential component, will be needed to a greater extent: it will create a certain tone of voice and parallel the goals of brand and performance marketers. Marketing agencies will be asked for more in terms of using performance media for performance and brand building. The incorporation of data and deep insights into the creative process enables advertising expansion into digital channels in a more profound manner. In practice, a vast majority of the businesses develop their brand creative based on a particular channel. Instead, a business must develop a central core message, claim, key value proposition, and all the assets should be created around it. Brand agency partners and creative teams have to shift their roles in order to work cross-functionally around data. In this context, personalization is a table stake. Broad segmentation has become a thing of the past, and mobile marketing automation tools are applied for one-on-one communication. The data-driven approach provides an opportunity to know exactly who the consumer is while he or she is shopping for a specific item. Marketers should be very careful about user’s trust — let the user decide what personalization factors are used to opt in and opt out. Strong partnerships between marketing and analytics departments help CMOs to get a clear idea of how well marketing dollars are spent. There has been a lot of debate considering whether brand and performance marketing are friends or foes. In fact, brand and performance marketing work perfectly well in a combo. Moreover, the perfect combo is when you adopt your brand awareness campaign to a performance-based native campaign. The digital ad campaign that combines branding and performance strategies can significantly enhance the overall impact. First and foremost, the connection with the audience happens on a qualitatively new level. The ability to target a niche audience makes it possible for the brands to create storytelling resonating with a particular group of people, and creating monetizable outcomes at the very same time. When the company splits how it tells its story and how it drives its results, the brand is also separated. Strong product value and brand story are much more effective when they are developed and marketed as one. When brand and performance marketing unite their efforts, it helps to save on budget and results. The merging of the entities can be perfectly described in one phrase: user-friendly performance and ROI-focused branding. Creative management platforms are empowered to apply dynamic segmentation via programmatic in order to test hundreds or even thousands of ad variations in a blink of an eye. Well, it takes a few minutes actually. Thanks to this, branding campaigns can be tweaked in the same manner as performance campaigns. We have to get rid of the mindset some marketers are still stuck in because brand and performance marketing ARE NOT different worlds. This is nothing but an artificial division. Usually, these teams do not realize how much they have to learn from each other. If we think about the audience, there is nothing it hates more than irrelevant and poorly targeted advertising. In present-day reality, the ‘versus’ stance must be forgotten. Brand and marketing performance get together to work as a whole — user-friendly, data — and measurement-driven.